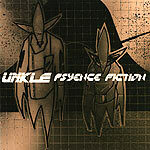 Probably some of DJ Shadow's best work to date, Unkle is the brainchild of Mo' Wax head James Lavelle. Futuristic b-boy beats mixed with indie rock sensibilities makes this a must have for any fan of Trip Hop. Features everyone from Kool G. Rap down to Radiohead's Thom Yorke. Deserves a place in everyone's collection.